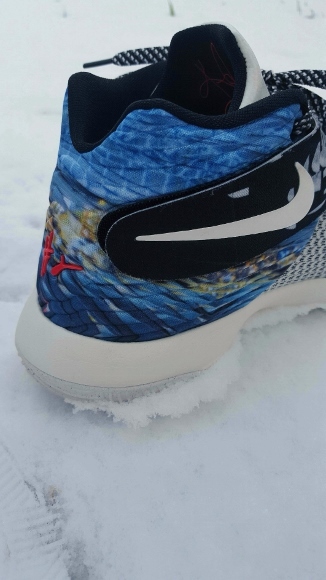 With Kobe retiring, someone has to take over the winter signature release for Nike. Why not Kyrie? After the success of the 1 last year, the 2 was one of the most anticipated shoes for this season. Just watching NBA games this season, it seems like half of Nike’s roster was wearing the Kyrie, so something must have been done right (I reviewed them here, and it was an alright shoe, nothing special). For an entry shoe, it was an impressive debut. Compared to shoes like the Curry, Rose 5, Lebron XII, and even the HyperRev 2015, it was a step behind (in my opinion). Now, the 2. New and improved. Better materials. 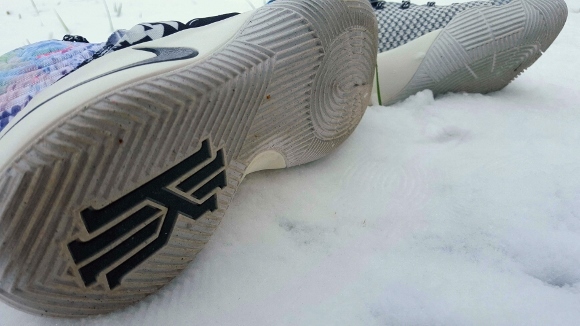 Better traction. Better fit. No, really, all of those are better. But don’t take my word for it — just watch this video about the shoe and read along below. 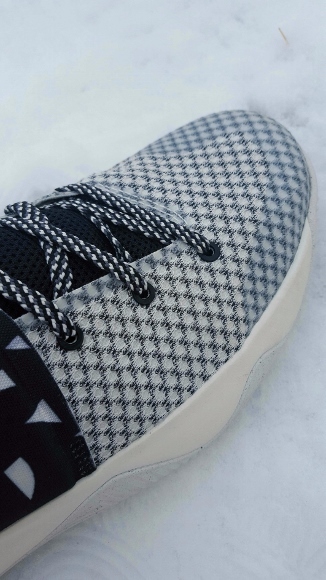 MATERIALS – Last year we got first generation Hyperfuse, and it was stiff and hard from the box. Again, entry level. This year we get an upgrade of the same Fuse material — not as stiff or hard. Actually, I thought the line between support and flex was walked proper — stiff enough to hold but still thin enough to not overwork the forefoot when running. The heel is a fantastic Lycra/mesh wrap that fits perfect around the ankle; I wish the WHOLE shoe was out of this material. It had a little Speedform feel to it but more padded. Thick ankle strap to pull the foot into the shoe. The sole is a one-piece rubber and thick but soft. One touch I like is the added leather/synthetic on the tongue, heel Swoosh, and ankle strap Swoosh. Little lux things. FIT – Simply put, one of the best fitting shoes I have ever worn. It’s funny, the last few shoes I have reviewed have had one category that the shoe really excels in. Either I’m getting soft or the companies are focusing efforts to fix problems. Either way, the narrow forefoot and harsh break in time from the 1 are a memory. The 2 is cut slightly wider but still snug without over-tightening. In the forefoot the laces are off-set but not quite asymmetrical. That looks really cool but I’m not sure of the benefits. Midfoot and heel are tied in together thanks to the strap. The STRAP. Not the KD4, but the Kyrie 2. I hated playing in the KD4 because of the strap. The Kyrie is WAAAAY better. Simply pull and close. The placement pulls the heel and ankle straight into the heel counter and with the higher lace holes and ankle cut, you are locked like Oz. The fabric heel allows for all the right moves without too much dance. I know I sound like an echo, but honestly, NO SUDDEN MOVEMENTS. The fit is the best I have tried in 2015. It would have won the category if I had them sooner. TRACTION – OOOOOOOOOOOOOO-WHEEEEEEEEE!!!!! Gimmick or not, traction works. And since they are so closely tied together in this shoe, we will get into transition also. 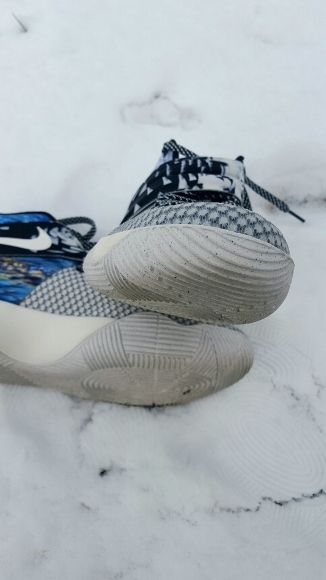 The outsole of the Kyrie 2 is made on a motorcycle tire design — specifically, the drifting tires — the treads go up the sidewalls for tight cornering and quick changes in direction. Kyrie is quick and makes changes in his direction, well, quickly. See the pattern? Last year’s herringbone was too tight and a little dust had you sliding. The circular Aztec crop circles this year grip in every way like Kung Fu Joe. The grooves are wide, rubber is soft, and the outsole touches the floor in every direction unless you go Turtle ston your shell. I did find the curved sole a little, well, unstable at first for shooting, but getting into movements the roll and traction pushed my foot into moves. I push hard off my medial forefoot, especially going left off of my right foot. A squared shoe would slide. A rounded shoe pushes and catches (don’t think this is new — another company tried this in the mid-90’s, Feet You Wear, and it worked then too). The thing is, they aren’t over-sticky, which sounds really funny, but sometimes a shoe sticks and won’t let go. The shape and sculpting are made for transition and movement and after three games I was in sprint mode. Smooth and low-riding, the Kyrie 2 is made for open court play. CUSHIONING – And then there was none. As good as fit and traction were, cushioning was the complete opposite of that. And again, not a new concept: the cushioning in the old FYW shoes sucked too. The idea is low, responsive, and quick; mushy, sinking foam is the last thing you want or need. But we are 20 years removed from that era — surely by now a way of incorporating some sort of padding for landings, especially with the dynamic guards in the league and colleges. Guards are rebounders, dunkers, shot-blockers, not ground-bound Steve Nash’s anymore. A Lunar insert, dual fusion, anything (rectangle Zoom would kill the rounded forefoot)! There is a Poron insert, but Poron is basically a foam overlay that will bottom out. Heel is Phylon and a rectangle Zoom, but I dare you to tell me you feel the Zoom. You’re a LIAR!!! The Phylon never broke in during testing so no heel give. Think Rose 1 from adidas — if you liked that court feel and cushioning, you will be right at home in the Kyrie 2. SUPPORT/STABILITY – I changed out of the Kyrie 2 ten minutes into my first wear. The forefoot bubble was too much. I was coming off picks and stopping for pull-ups and feeling like my feet were wobbly, my ankles were moving. The next day, I went and shot for an hour and a half — drills, stations, jumpers, chair picks — and I worked my way into them. After that session I played five games of full and never had a problem again. The shoe is different. Very different. But different is not bad. If you can get past the initial feel, you will get a quick, biting shoe. The sole is wider than the upper, especially on the lateral side, so ankle rolls should not be a problem. Not a large outrigger that feels clunky, but a molded and formed edge for transition. The strap is the tool and with the added lock in provided you have no issues with heel slip or instability from fit. OVERALL – Foot rocket. Fast. Quick. Traction. Cornering. All of these things make the Kyrie 2 what it is. If you are a quick, fast, light guard who blows by everyone and crosses over without slowing down, you NEED to get a pair of Kyrie 2’s. If you are like me — knees are going from court years — and need cushioning, keep moving. Once a week, maybe two weeks, and you could play in these. Every day, it is just too harsh. I love the looks and the direction, but I can’t wear them too often. That said, I will be all in on the 3 next winter. If the improvements from the 1 to the 2 look like this, the 3 is destiny. Just hope they stay away from those Kobe prices. Thanks for the review Bryan. Nice video. At times however, the music is too loud and we can’t hear you. I wish you a speedy recovery after surgery. Hope we have you (and your beautifully crafted reviews) soon. We’ll be patient til then! 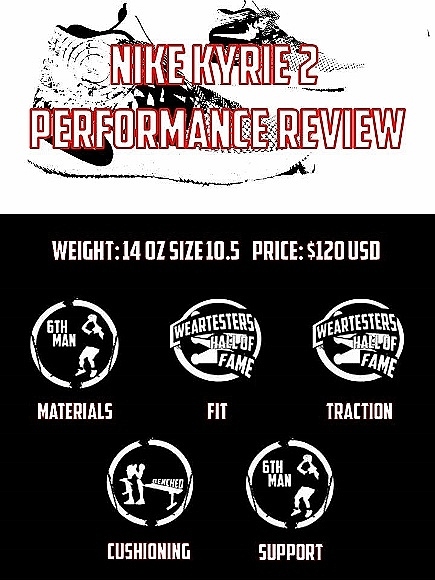 Great review, it’s definitely not my type of shoe(I’m too old, too heavy), but I do love Nike’s effort to make a more outspoken shoe, to really drive that focus on movement into 3-D, because when that’s perfected, it could redefine shoes, period. I swapped out the insoles on mine, & that made a huge difference. Really fun shoe to play in! Quick questions for you because I am genuinely curious about the demographic of people who like this shoe. How old are you (for wear and tear curiosity)? Do you play primarily on the ground, are you a high flyer, or are you somewhere in between? Do you play competitively or for fun? How long are your playing sessions in the shoe? I ask these questions because I really want to know that people who enjoy the shoe to gauge its purpose. I think that it could have used some cushion and it wouldn’t have affected the court feel at all especially for a player coming off of leg injury regardless of the type of injury. Thanks in advance if you choose to respond. I am 5’10” and weigh 200 lbs with 12-15% body fat. I used to be a flyer, but now I am between. Go hard on rebounds and drives but not as active trying to block shots or after loose balls. I am ALWAYS competitive. Even driveway HORSE with kids, I want to win. I play in the shoes at least 5 times of full court games, usually 4-6 games each time, and then a couple of workouts if I think I missed something. Thanks for taking the time to reply Duke. I really appreciate your input and responses. I originally meant the questions to be for Mike Langley but your input is ALWAYS seen as a plus to me so thanks again man and I hope that all is well and the holidays were enjoyed. I’m 37. 6’5″/230lbs. In between game – gotta keep the body sound. I play semi-competitively 2-3 hours a run 2-3 times/week, & at least one league per season. I haven’t yet gone a full 2 hrs in the Kyrie’s. I’m quick to switch shoes for superstitious reasons, & my feet have gotten fatigued while I’m breaking in the new soles. For reference, I was rotating Soldier 9’s, Curry 2’s, & Super.Fly 4’s before I picked these up. Hope that helps! Thanks for taking the time to reply bro and yes, that really does help because it tells me that switching the insole might actually help me if I decided to give these a shot. I genuinely appreciate it man. I mainly rely on my mid range jumper and my slashing play style. I play for fun, but am about to start playing competitively. I usually play for about two hours, whether in the driveway or at the YMCA. I ask these questions because I really want to know THE* people who enjoy the shoe to gauge its purpose. No worries Josh. Trezz and I go way back. Great lol. All I find myself wondering is what if boost could in these shoes. They could probably get away with less cushion cause boost is superior. Even a stiffer version. Less cushion theoretically more court feel. Full length means transition. Boost is God. Boost is life. It’s just like … Poron? Really? Nike needs new cushion if they’re ever gonna think about they’re long term battle against the other big two (and brand black) companies. Seems like either they’ve become to complacent or all the innovators went somewhere else. You nailed it right on the head with the word “complacent”. It’s funny when you say “Once a week, maybe two weeks, and you could play in these” considering the fact that these were designed for a guy who has to play basketball every day and plays 82+ games a season (ok he’s hurt a lot, but you get the point). I sometimes wonder whether they make special versions for the players? A good comparison over all. 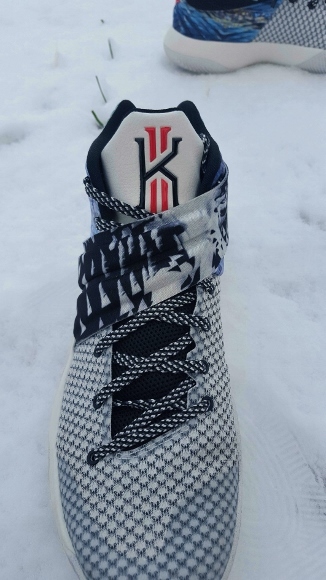 The kyrie doesn’t have the cushion but traction is close. Not as thick so it probably won’t last as long, but feel is same. Curry 2 is better overall though. Lebron Soldier 9 is also really good and easier to find. as for how they stack up against other shoes…i think they are different, and people who play a grounded game premised on footwork, changes of speed and direction would really enjoy these…as for the cushioning, if these are, by all accounts, terrible in that department, then i guess i’m not somebody who really needs much as far as cushion goes (the crazyquick 1 is still one of my all-time favorite shoes, though again i would have to say that those are more noticeably ‘minimal’ in the forefoot than the kyrie 2, i don’t know why that is)…. Tadatsune, one of the problems with being a weartester is we only get a couple weeks of wear before the review needs to be done, so a lot of our wear is really not a good break in based time. I have been wearing the 2 almost every day since my surgery just for casual and it has gotten WAY better in that feel. I love the CQ1 as well, very underutilized technology, and the Kyrie 2 will stay in rotation. Just at my playing age I wanted a little more either cush or bounce. So, Im 6’2″ 40 yr old, 220lbs former college guard. I still have lots of speed at my age but not as much bounce. My game is predicated on creating space for jumpers and using my body to get to the hole, think Chauncey Billups. So i have been looking for the last 9 months for the perfect shoe. U have bought and returned the 15 Hyperdunk, old school Nike FLight 90s, UA CLutch FIt Drive Mids, UA AnatomixLows and the Jordan Carmelos from early 2015. Here’s my issue, ankle support have never been a problem but i worry about it as I progress in age. I have traditionally loved the 3/4 cut shoes but have experimented with low tops and more recently high cut shoes the the HyperDunk 15 and the Clutch fit; both of which are to bulky and restricting. Im afraid to go all the way low like a Kobe, KD orotherwise. So Im here researching and I hear that this is similar to the Feet you wear from Adidas. During my College playing years i wore the Adidas Top Ten 2000s and they have been my all time favorite shoe. SO MY QUESTION. Im considering the Nike HyperRev 2016 and the Kyrie 2. I want the low top feel and weight with the 3/4 support…so which one???? Out of the two, and I have only tried on the Rev 16, can’t get back on court yet, I would get rev. A little more cushioning but the sole is molded into a very organic shape, kind of like the old FYW. Not as extreme, but not flat. And it has a little more bounce for impact protection. I like threads like this that promote dialogue. I have gotten to hear a lot of different perspective on the shoe which is interesting. Everyone’s bodies really are different. I’ll add to the stats. I’m 28 years old, 5’7″-5’8″, & 182 solid lbs. Most people who see me don’t believe that I’m actually that heavy but there’s muscle under it all. LOL! I used to love being by the rim and could get up there easily although I could never bring the ball over it with me. Nowadays I get close but not above it like I used to. I have grown to love cushion. I abused my legs back in the day and never cared about icing or what I wore. For that, I now pay for it greatly with knee and other foot issues. Thanks to everyone who contributed to the dialogue and shared their experiences. This is what it’s all about. I’m a bigger player, sometimes my sneakers bottom out before they have any tears or ripped. Just like my CQ1 I played with them a couple months indoors the exterior is still looking fine, forefoot is okay but the heel is completely sinked in.